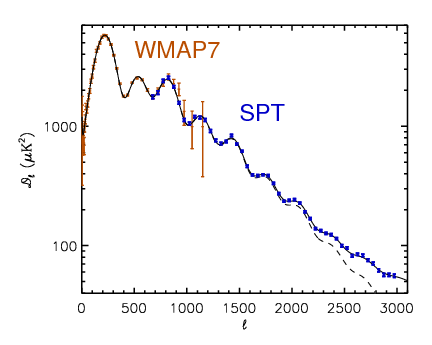 This page provides data products associated with the SPT measurement of the CMB power spectrum described in astro-ph/1210.7231, Story et al. 2013. The power spectrum is presented over the multipole range 650 < ell < 3000 and can be used to constrain cosmological models. The data products here also relate to the results of astro-ph/1212.6267, Hou et al 2014. Update Aug 2017: We have updated the released bandpowers and select chains to resolve the bias related to the calibration treatment and improperly left-out term in the beam uncertainty. Information on this bias can be found in the Appendix of astro-ph/1706.10286, Aylor et al. 2017. Update Dec 2017: We have converted to likelihood to be compatible with current versions of cosmomc (which have dropped newdat support). We also include a version of CMBlikes.f90 with support for aberration corrections, which as listed in astro-ph/1706.10286, Aylor et al. 2017, changes the peak positions slightly. If you have any questions regarding this data set or its use, please contact Christian Reichardt (christian.reichardt_at_unimelb_edu_au). Update: Dec 2017: The data files and updated CMBlikes.f90 file necessary to incorporate the SPT likelihood in current versions of CosmoMC can be found here in a gzipped tarball. The included README has instructions. Update: Aug 2017: Files with the missing beam terms and revised calibration treatment can be found here in a gzipped tarball. The included README has instructions. Update: Jun 11, 2014: Files compatible with the latest (May 2014) version of cosmomc can be downloaded here in a gzipped tarball. These files can be used without recompiling cosmomc. The included README has instructions. An alternative form of the newdat file with the calibration uncertainty moved from the covariance matrix to line 10 can be found here. These are the SPT 150 GHz Bandpowers from 2008 to 2011 observations. The bandpowers cover the multipole range 650 < ell < 3000 in bins of delta-ell = 50. An alternative form with the foreground priors placed in the newdat file is here in a gzipped tarball. Note that chains in the paper did not use this form, and that the implemented prior no longer gaurantees each of the three foreground terms is positive definite. We expect the latter effect to be small. This newdat file may be simpler to use since it is compatible with an unmodified version of cosmomc - there is no requirement to add the three SPT foreground terms to cosmomc. The foreground amplitudes are also required to be positive. A text file with the bandpowers for plotting can be found here. If you have any questions regarding this data set or its use, please contact Kyle Story (kstory_at_uchicago_edu). Update: Aug 2017: We have uploaded a select set of key chains run with the revised likelihood. These files can be browsed here. We have uploaded a raw dump of compressed (tar.gz) chains. Each tar file corresponds to a single dataset/cosmological model combindation. These files can be browsed here. We will add documentation and a more user-friendly interface soon. Update: Dec 2017: The code, data files and compilation instructions can be found in the Bandpower section. We do not recommend using earlier versions of the bandpower files. Please see the Likelihood section here. The new bandpowers and foreground templates can be used with the Keisler et al. 2011 likelihood code for cosmomc. These modifications to cosmomc are not necessary if the newdat file including the foreground priors linked above is used. The SPT-CL cluster likelihood used in some chains can be found here.